Following is a quick summary of May and June. Doña Máxima held the Club de Artesanas meetings once a week at her house while I visitedtheU.S. 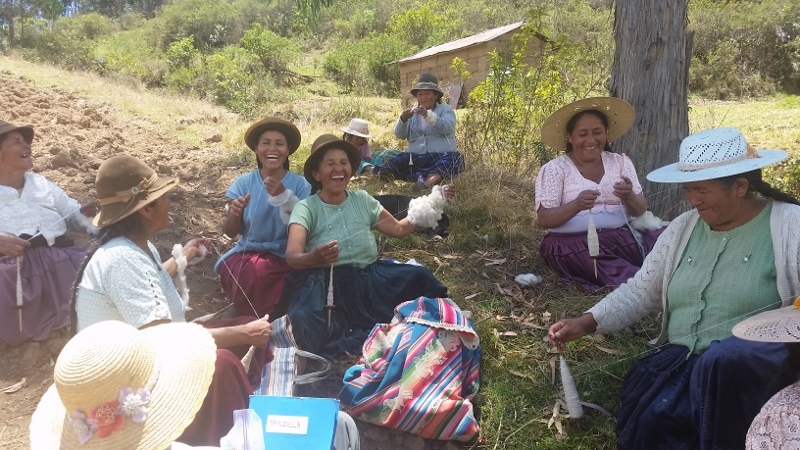 Thanks to PAZA supporters the meetings were productive because the women were able to purchase yarn so they could work on crochet projects while chatting. 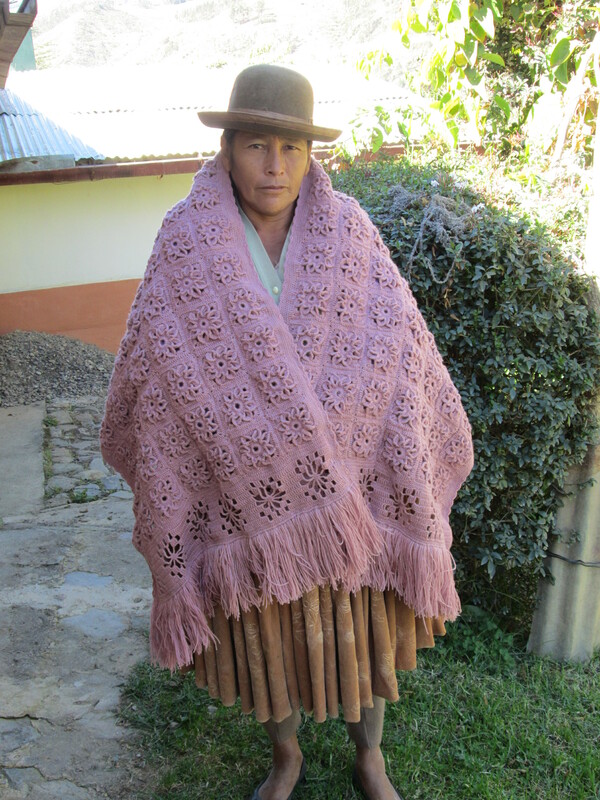 Doña Antonia crocheted a shawl and began wearing it immediately to ward off the cold of the winter months of June and July. Coats are not part of the women´s wardrobe. They layer on acrylic sweaters and shawls. 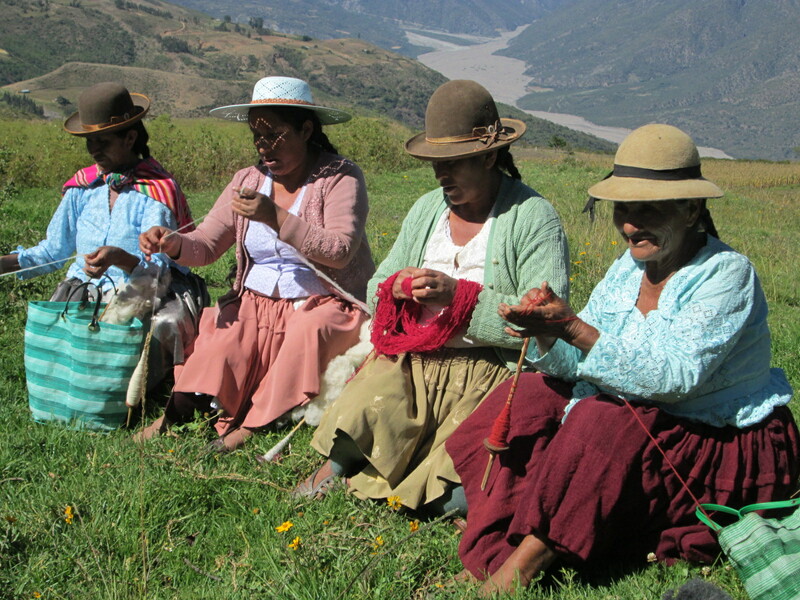 Doña Máxima spent hours at her loom weaving the necessities for her husband´s regalia as mayor of Huancarani. When her hands weren´t otherwise occupied she had her pushka (drop spindle) in motion to ply the purchased yarn tightly in preparation for the next weaving. 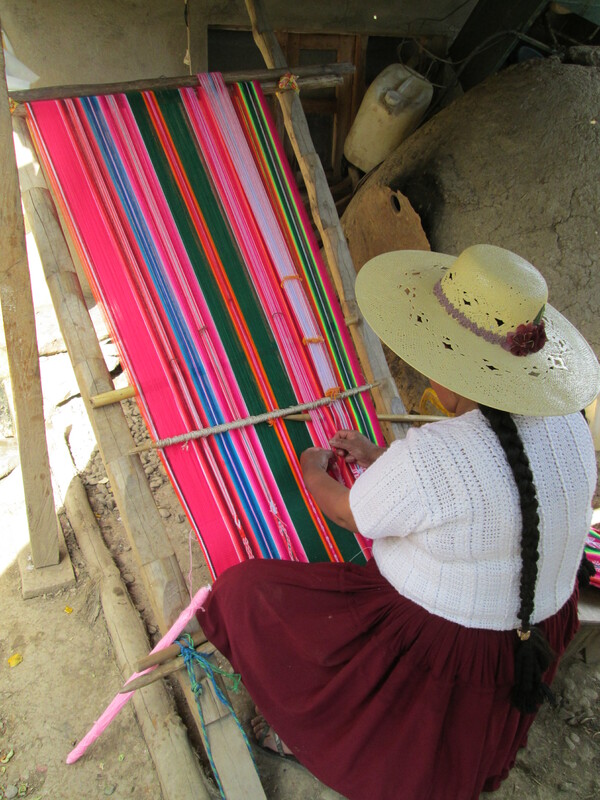 In early May, she warped her loom to weave half the aguayo with bright neon colored synthetic yarn, commenting that it made the natural dyed yarn seem dark and boring. The weaving had 4 columns of figures with 1 heddle string and 1 column of figures using the embedded double weave technique that uses 5 heddle strings and 4 weft threads. It was slow going and occupied most of her time for more than 2 weeks. Upon completion she warped her loom to weave the figureless poncho desiring the reward of making quick progress. She completed it in 4 days. 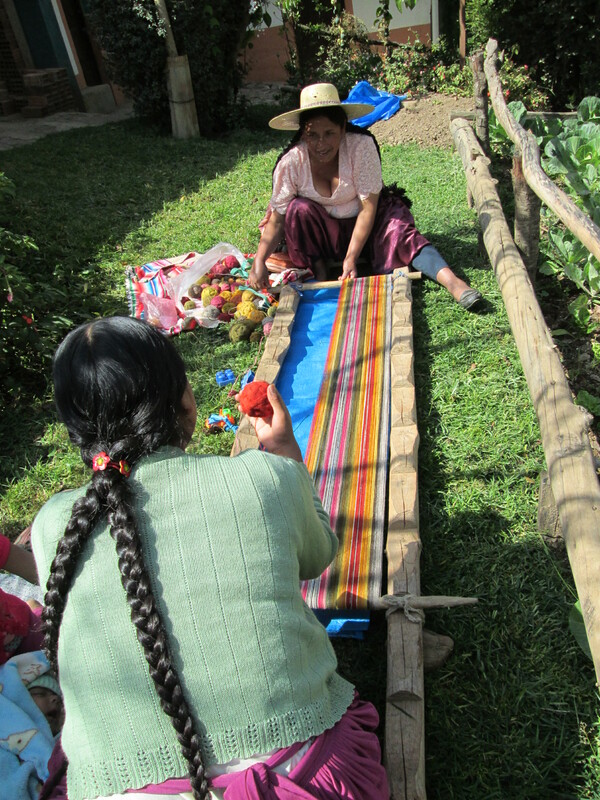 Upon finishing the poncho she immediately warped her loom again to weave the other half of the aguayo. Weeks later she used a decorative stich to sew the two halves together. The final step was a crocheted border.She’d planned on weaving a second aguayo for herself, but lacking time and energy it will be woven without the motifsonly possible using the embedded double weave technique. Her daughter Vilma had expressed a desire to learn the technique, but changed her mind after observing the painstaking process. The technique allows the weaver flexibility to experiment with figures, so weavings are often a motif mix of the ancient and the contemporary such as helicopters. Sadly, the skills to weave with thistechnique that has been used to create beautiful Andean weavings for eons will disappear as the ageing weavers pass away taking with them the skills they perfected as teens. The mayor’s wife must also appear at celebrations and rituals properly attired. 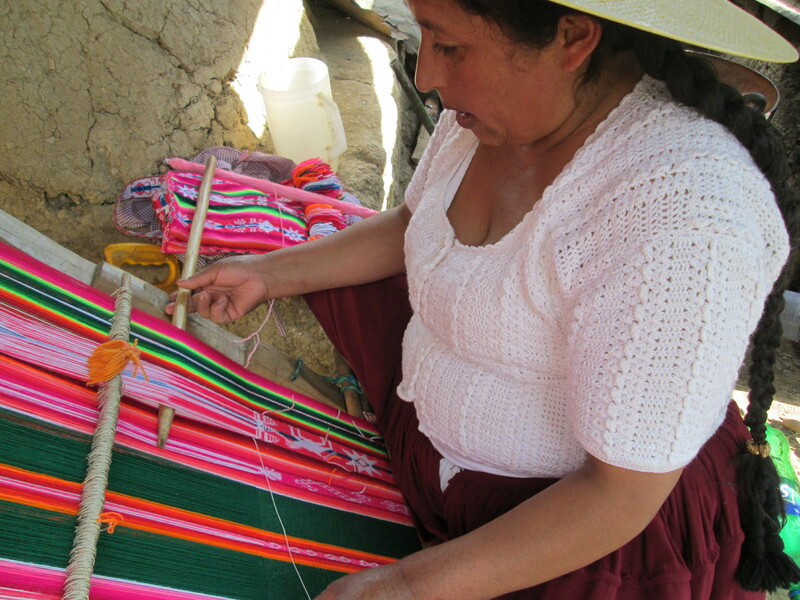 PAZA purchased material for Doña Máxima to sew a traditional wool pollera (skirt) and a blouse, to help make up for her wage being halved because the Club de Artesanas met only once instead of twice a week for 2 months. Both Don Julio and Doña Máxima will be in full regalía for Bolivia´s Independence Day celebration in Huancarani on August 6th, so photos will be included with the next blog posting. The annual WARP Conference is always a highlight of the annual U.S. trip. Amanda Smiles, founder of Ruraq Maki, presented her ongoing design efforts to create woven products that will find a market. She has brought pattern ideas and samples for bags for the past 3 years to Independencia and came up with the idea for the yoga mat straps. At the Conference Amanda met WARP Board members Katie Simmons and Kelsey Wiskirchen who have visited Independencia as PAZA volunteers. Amanda purchased weavings to sell through Ruraq Maki’s sales venues. Katie and Kelsey kindly lugged home weavings to sell so that the PAZA weaving inventory in the U.S. didn´t have to go into storage until next year. 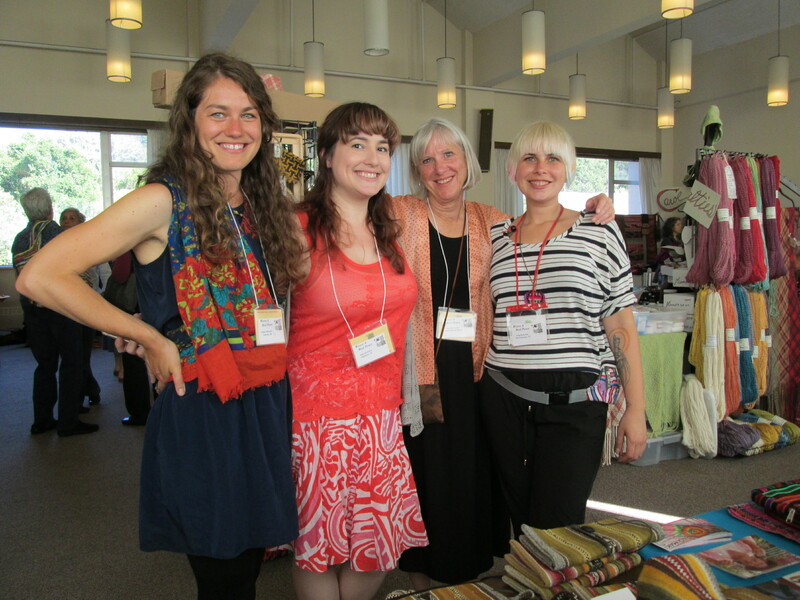 Marilyn Murphy of Thrums Publications and Cloth Roads was also at the Conference. Those organizations with Marilyn as the PAZA contact will again sponsor the Independencia Spinzilla team, the WarmisPhuskadoras (Spinning Women). 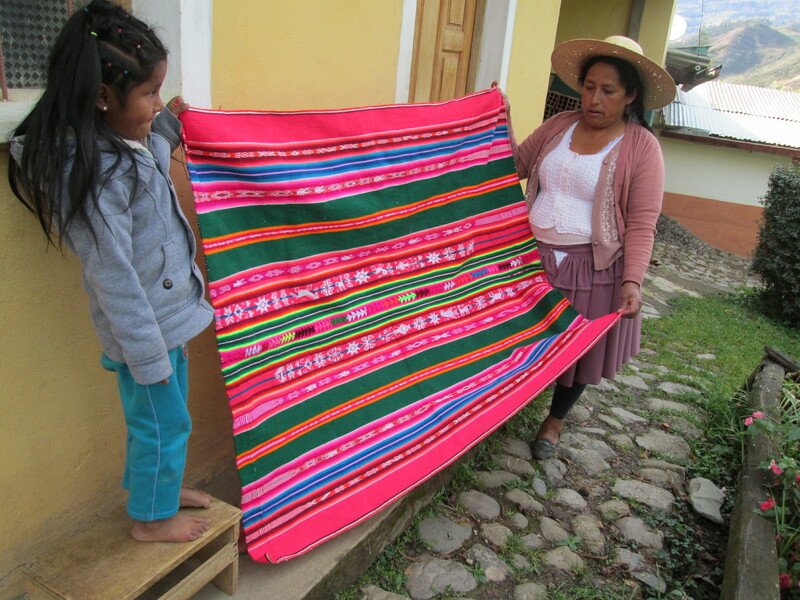 Marilyn made purchases of Independencia weavings to sell through Cloth Roads. If you would like to purchase a weaving please contact one of the U.S. connections. Each sale motivates the weavers to keep weaving. The expenses for last year´s Spinzilla competition were $600, and this year´s competition is not as yet funded. Please consider supporting the team.